The Left Front, the BJP and trade unions on Thursday termed the 12-hour general strike in West Bengal as "an unprecedented success", while the ruling Trinamool Congress described the bandh in the state as an "utter failure". 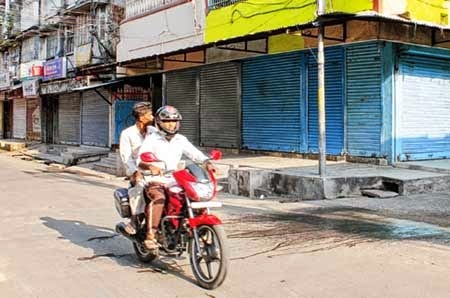 Normal life was partially affected across the state by a 12-hour general strike called by Left parties and trade unions as well as a 10-hour bandh called by the BJP to protest against alleged violence by ruling Trinamool Congress in the recent civic polls. "The strike has been an unprecedented success in Bengal. The people have openly come out in support of the strike. The success of the strike proves that the masses too are angry and disenchanted with the TMC over anarchy and violence let loose by TMC during the KMC and municipal polls," Bose said while addressing a media conference. "The TMC has tried to use all kinds of forces, from administration, goons and money power to foil the strike. They even ransacked buses which didn't ply today. Since last two days they have been threatening traders and transport operators not to support the strike," Bose alleged. TMC secretary-general and state education minister Partha Chatterjee termed the strike as an utter failure, saying the people are against halting the development process in the state. "The strike has been a complete failure and the people of the state are against the backdated culture of strikes and bandhs. The sinister agenda of the opposition CPI(M) and BJP has been foiled by the masses. Those who do not enjoy any mass support are trying to stop the development of the state," Chatterjee said. Though, the transport services, including the Metro Railway, suburban trains and state and private buses were available, there were fewer people on roads. There were reports of stray clashes between bandh supporters and the ruling party workers, who opposed the strike, in some parts of the state. BJP state President Rahul Sinha today said the strike was complete success as it was not confined within the limits of any political party. "The strike has been a complete success as it was not confined within the limits of any political party. The people themselves has been made this strike a successful. The way the police has tried to foil the strike is condemnable," said Sinha. Left Front chairman Biman Bose slammed the government for being insensitive towards the students of certain universities, where scheduled exams were not postponed. "There has been no such precedence since Independence that exams have not been postponed whenever there has been a strike call. But this time the government being adamant played with the future of the students as exams in various universities were not postponed. This is a shame," Bose said. Chatterjee, however, claimed that the students have given a befitting reply to the opposition, with 100 per cent attendance in the examination centres. CITU state president Shyamal Chakraborty claimed the strike to be 100 per cent successful. "The strike has been a 100 per cent success. It is after a gap of more than 30 years that both the working class and the common people have jointly protested against the anarchic TMC regime by supporting the strike," Chakraborty said. Bose said the hundreds of Left supporters and workers were illegally detained and arrested by the police, when peaceful rallies were taken out by the Left parties in the district. "The police was used to foil the strike and propagate that shopkeepers should keep their shop open. They have even arrested several party workers and cadres in the districts of the state. Former Left Front MP Saman Pathak was also arrested by police in North Bengal," Bose said. Even as hundreds of pro-bandh supporters were today arrested across Bengal and Siliguri witnessed a total closure, the 12-hour strike called by the Left Front and supported by the BJP to protest the alleged violence and vote rigging by the Trinamool however, failed to have any impact in the hills. Business and educational establishments, government and Gorkhaland Territorial Administration offices remained open all through the day in the hills. Vehicular movement continued as usual, although those headed down to the plains of Siliguri were few in number. The Left Front had called a 24-hour bandh today while that announced by the BJP was a 12-hour one, till 4pm. Siliguri, which has seen a change of guard after the just concluded municipality election, remained true to its decision to choose CPI (M) veteran and mayoral candidate Ashok Bhattacharya. The strike was well supported with markets and business establishments downing shutters and most vehicles keeping off the roads for the day. BJP, would support the strike. However, the GJM leadership chose to remain quiet on the issue. “We don’t want to make any comments now,” said a senior central committee member of the party when asked. The GJM supported the BJP in the 2009 and 2014 Lok Sabha elections in return for the latter’s backing in demanding a Gorkhaland state. Senior BJP leaders and RSS functionaries continue to visit the hills to show their solidarity towards the statehood demand. After its second phase of agitation for a separate state, the GJM has refrained from calling strikes. It even called off a strike proposed earlier this month in protest of the state government’s decision to appoint para-teachers for the Lepcha language in 47 primary schools. It termed the appointment as undue interference in the functioning of the GTA.